Remove the inflatable restraint steering wheel module. 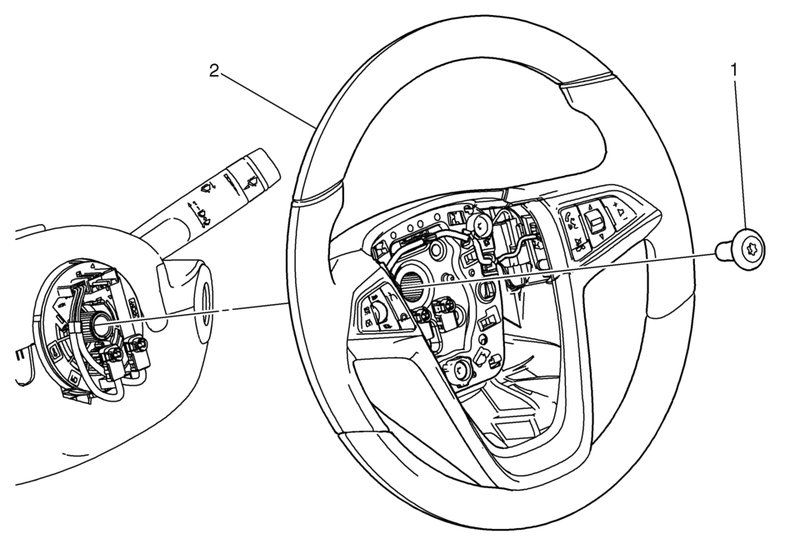 Refer to Airbag Steering Wheel Module Replacement. Use paint in order to place match marks on the steering wheel and on the steering column shaft. Clean thread of the bolt. Apply NEW locking compound to the thread. Refer to Adhesives, Fluids, Lubricants, and Sealers. Disconnect all electrical connectors as necessary. Loosen the steering wheel bolt until 2 to 3 threads are left engaged. Wiggle the steering wheel until the steering wheel disengages completely. Remove the steering wheel bolt. Copy the match marks from the old steering wheel to the new steering wheel. Transfer any parts as necessary.